Florence is often considered as the leading city of art during the 15th century, especially in the early half as the International Gothic style evolved into the Renaissance. This period of art is formally referred to as the Quattrocento. Great names such as Donatello (1386 – 1466) and Ghiberti (1378 – 1455) emerged in sculpting, and in paining; Masolino (1383 – 1447), Masaccio (1401 – 1428), Fra Angelico (1395 – 1455), Filippo Lippi (1406 – 1469), Gentile da Fabriano (1370 – 1427) as well as architects such as Filippo Brunelleschi (1377 – 1446). 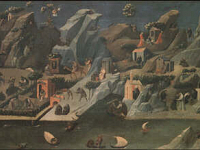 This particular work in the Uffizi, Thebaid, a depiction of the ancient region of Egypt, has been attributed to a number of early 15th century Florentine Masters. This includes the acclaimed painter Fra Angelico or also Starnina, probably Gherardo Starnina (1354 – 1413), an early Quattrocento painter. According to Giorgio Vasari (1511 – 1574), Starnina trained with the painter Agnolo Gaddi (1350 – 1396), son of the painter Taddeo Gaddi. 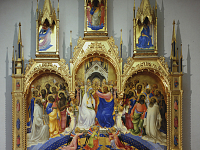 Starnina is also noted as painting the frescos in the Castelani Chapel of the Santa Croce in Florence, as well as in the Spain at the Cathedral of Toledo.